Before the NBA season began, I looked at three players on the verge of superstardom: John Wall, Eric Gordon, and James Harden. Now that we’re at the All-Star break, the time seems ripe to check in on these players. Let’s focus on Harden and Wall, since Gordon has only played two games this season. Harden and Wall almost seem like extreme opposites of each other. Despite coming off the bench, Harden has made great strides, and his Player Efficiency Rating (PER) has jumped from 16.48 to 21.20. He has become the best sixth man in the NBA. Wall, on the other hand, has been struggling. Now, before we get into his troubles, it should be said that Wall’s game hasn’t regressed, but he just hasn’t improved that much since last season. 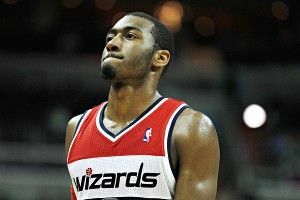 Many NBA observers expected Wall to enter the “best point guard in the league” discussion this year. Instead, his PER has gone up only slightly, from 15.85 to 17.62. Before the season, I wrote that Wall had to improve his backcourt play. His points per possession (PPP) of 0.730 in halfcourt situations last year put him in the bottom 15 percent of all NBA players. 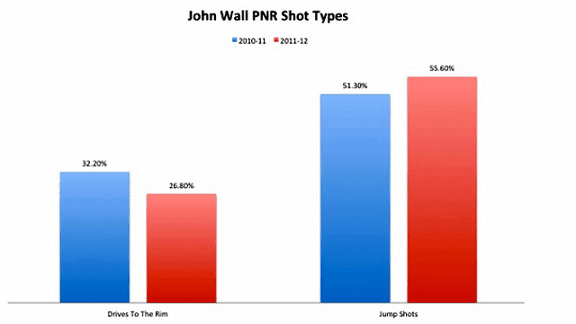 Technically, Wall has improved his halfcourt game, but only to a still-meager 0.740 PPP. He has stormed out of the bottom 15 percent of the league and into the bottom 25 percent — that’s not exactly cause for celebration among Washington Wizards fans. The chart above, using numbers from Synergy Sports, shows that Wall attempts more jump shots off the dribble in pick-and-rolls this season. He shoots just 30.6 percent in these situations, compared to 54.5 percent when he drives. On this possession, JaVale McGee sets a good screen for Wall, who comes off the pick with a full head of steam. The Kings lay back against him, and as Wall’s man gets caught on the screen, Wall faces a one-on-one against DeMarcus Cousins. With Wall running at full speed and Cousins backpedaling, it looks like Wall will find an easy way to score. However, Wall lets Cousins off the hook and settles for a jumper. That’s a bad shot, considering that Wall was sprinting before he pulled up. Some players, such as Russell Westbrook, can stop on a dime and rise for a smooth jumper with proper form. Wall is not one of those players. Here, he lets his forward momentum bother his shot and misses the rim completely. Let’s watch is another possession. Here, Wall’s man again gets stuck on a screen, and no other defender steps up to help. Wall has a clear path to the rim, but instead of taking it he shoots a jumper at the elbow. Let’s look at a screen shot just as he picks up his dribble. Wall has a ton of open space in front of him, but he never bothers to explore it. If he took the ball to the rim, he might have gotten an easy layup or drawn a help defender, opening up a shot for Nick Young. 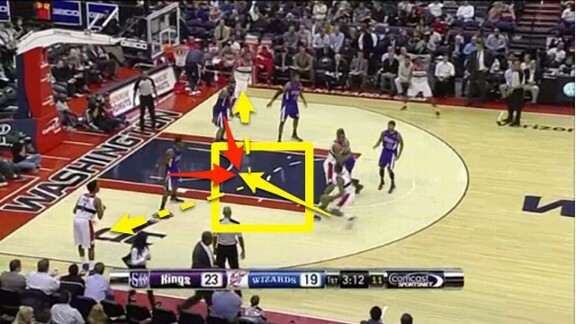 One of Sacramento’s big men might have stepped up and allowed wall to find Rashard Lewis open on the baseline. When Wall’s man got stuck on the screen, Wall faced a number of decisions, most of which had a solid chance of leading to a good scoring opportunity for Washington. Instead, he chose the one option that was guaranteed to be a low-percentage play — John Wall shooting off the dribble. It’s a totally different story for Harden, who thrives in the halfcourt offense. Harden’s PPP in the halfcourt last year was 1.009. That already put him in the 91st percentile of NBA players, with not much room to improve. But that’s exactly what Harden has done. This year, his PPP in halfcourt offense is 1.069, which places him in the 97th percentile. He improved his numbers by getting better in pick-and-roll situations. Harden’s PPP in pick-and-roll situations this year is 1.026, again in the 97th percentile. In multiple ways, Harden has improved from very, very good to exceptional. Last year, Harden didn’t struggle in pick-and-rolls, but he wasn’t great at using high screens. This season, he has figured out how to succeed in these situations. He posts 1.179 points per possession in high pick-and-roll plays, which is good for another eye-popping 95th-percentile statistic. What is Harden doing differently this season? Attacking the rim. This chart, also using stats from Synergy Sports, shows that Harden has all but eliminated dribble jumpers from his high pick-and-roll arsenal. Instead, he is driving to the rim in 55.4 percent of these situations and posting a league-best 1.528 points per possession on 66.7 percent shooting. Harden also gets fouled on 29.2 percent of his drives when working off high screens. This year, instead of settling, Harden is attacking the defense, and it’s working. Harden has to ability to finish in traffic, and by not settling for jumpers and keeping his dribble alive, he is getting to the basket and making good plays. Last year, when Harden used high screens, his first dribble was often passive. He wasn’t using it to put pressure on defenders. This year, Harden is almost always in attack mode. Harden’s improved pick-and-roll play is the biggest reason for his breakout year, as well as a reason he is considered a favorite to be named the NBA’s Sixth Man of the Year.